I had never heard of a gift-wrapping party until I was invited to one three years ago. From that day on I was hooked, and now it is one of the holiday events I most look forward to. What is a gift-wrapping party? It’s exactly what it sounds like. You get together with a group of friends, have refreshments, and wrap your presents. It’s an incredibly fun way to knock out what is usually a very isolated task. Although the party itself can vary based on the host’s preferences, there is one basic rule that should be included on your invitation — each attendee should bring at least one roll of wrapping paper, a set of gift tags, and a package of ribbons& bows to share. For someone like me, who usually likes to theme her wrapping, this was a tough rule to follow. My first year, I brought my own wrap, and just picked up an extra roll of paper, tags and bows to donate to the party. When I arrived and saw all the exciting new papers available, I got into the spirit of the party and started to mix and match. As the host, you have a lot of different ways you can run the party. Some of us love to plan every little detail — a menu of finger foods and desserts from Pinterest, a festive tablescape, wrapping station tables set-up around the house, and a custom Christmas playlist. Some hostesses even have a prize at the end for the guest whose gift is voted “best wrapped” by her fellow partygoers. Your first step in planning any party is to send out the invitation. Unlike my fellow Wilderness Girls Rachael and Christina, I tend to not be a paper invitation girl – I love me some evites. There are a few reasons for this. First, I always have my phone or tablet with me. So, an electronic invite is great because I can easily RSVP whenever it’s convenient, and as long as I keep the link to the evite, I won’t ever have to worry about leaving the house without the directions, and having to turn back. As a host, I like having the ability to update the entire attendee list through the website. A final benefit is that it’s a green alternative to a paper invitation, but honestly, the green that I get concerned about is the cost to buy invitations and mail them, so saving money is another great reason to go electronic with your invitations. Now that your invitation is out, you want to think menu and décor. 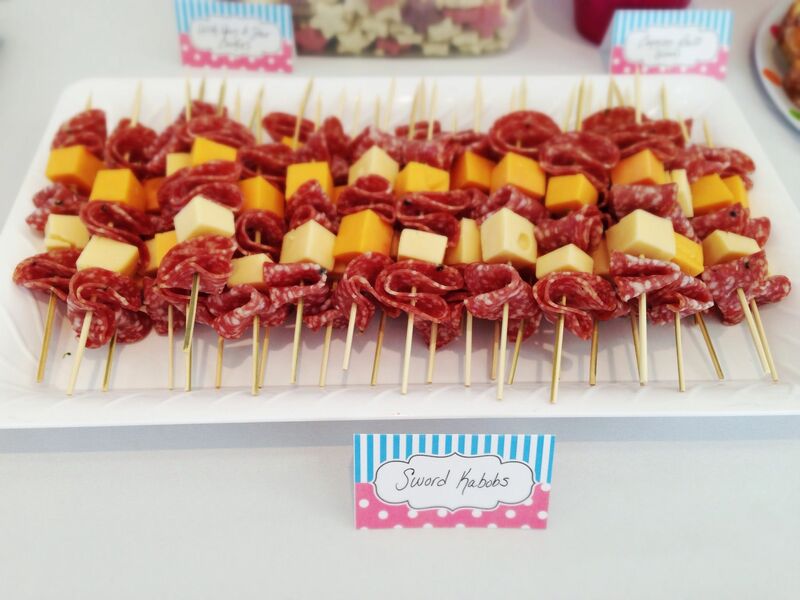 Some of my favorite finds from Pinterest for parties are holiday sangria, and hearty finger foods that you could avoid touching or that aren’t too messy (since you will be wrapping presents) – salami & cheese skewers, hummus and veggies in a cup, strawberry shortcake bites and white chocolate popcorn. For décor, I love using Christmas scrapbooking paper for a flag banner (inspired by this pin), and chain garland for the food table. Everything else tablecloths, napkins, etc., you can pick up at your local dollar store, or the dollar bins at Target. Finally, as the host, make sure you pick up a few extra pairs of scissors and rolls of tape. The dollar store carries both of these items as well, so pick them up there, or remember to ask each attendee to bring her own. You can either designate a table to hold all the rolls of paper/ribbons/tags that people are not using, or you can get a wire trash can to hold the rolls and use bins or baskets that you have around the house to hold the tags, ribbons, etc. And that’s it! Again, the beauty of this party is that you can make it as fancy and elaborate, or casual and laid back as you want. If you have any tips or ideas for a gift-wrapping party that you would like to share, please do so in the comments below. Have a happy holiday season!